STEAM Co. Day activities — STEAM Co.
Key to a STEAM Co. Day are the 20 or so creative thinking and doing activities the children get to choose from from across the spectrum of STEAM subjects. In three years we've staged about 50 different activities and want to both add to this database and put it online to share with other schools who want to run STEAM Co. Days. We're currently looking for funding to help us do this.or now here's a snap shot of a few of our existing activities, each are designed against clear STEAM Co. objectives and take about 20 minutes to complete. Learning to human beat-box and joining in a mass finale in the closing assembly. What else are you going to do with the smallest room in the school? The perfect chance to let off some steam, and now a regular fixture at school events throughout the year. 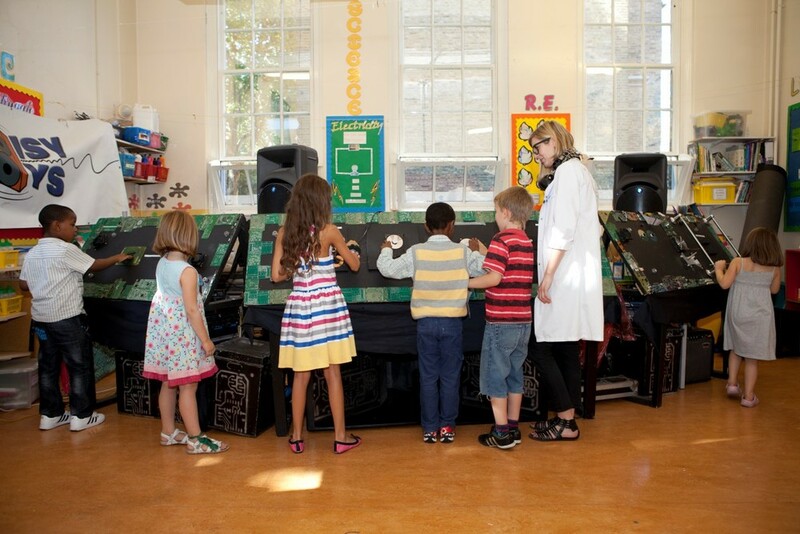 A Coder Corner activity which gave the children the chance to program a version of the classic arcade game that gave Steve Jobs his first break in computer programming. The children did this in the Scratch programming language on a Raspberry Pi computer. A week before the STEAM CO. Day, to build the excitement, every child takes a template home and makes a flag from an old piece of fabric. These are all threaded together by a working party of mums and wrapped around the school on the big day giving every child a sense of ownership. 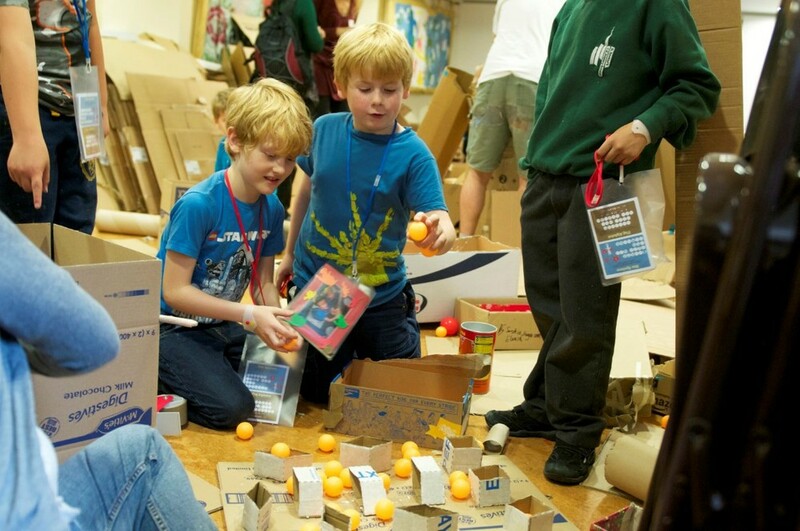 We joined the global cardboard challenge: one million children around the world making toys and games out of cardboard boxes, inspired by Caine Monroy and his arcade in LA. This activity saw on live on the BBC Breakfast show. This activity saw half a ton of clay delivered to school and the children got to contribute theirs ideas and inspiration to co-create a sculpture. An animation activity where the children storyboarded and filmed short sequences that were linked together and played in the closing assembly. In the week before the STEAM Co. Day, Year 6 children built a Greenpower Trust Goblin Eco car with support from Ford. They also held a co-creation innovation workshop to brainstorm a suitable material for the body shell. On the day, every child added a part of the body shell from old juice cartons and it was raced at Goodwood. Music and dance are important aspects of the STEAM mix, and our improv workshop led by the music teacher, is a great hit across the board, improv not normally being part of the curriculum. One of our favorite activities by one of our favourite creative collaborators and inventor Darcy Turner. Darcy's amazing Stixx rolling machine is used to create Stixx from which we can build big strong structures by understanding basic structural engineering principles. Creating our own newspapers, not using computer software, but good old ink and wood cut blocks and applying pressure. 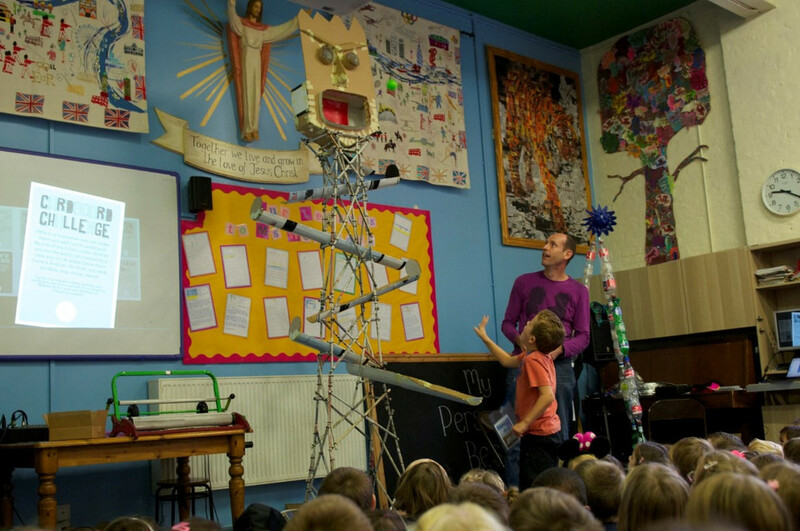 Our friends come down from Manchester with a van full of crazy contraptions and teach us about the principles of making electronic music. We convinced a design collective we met at an exhibition to bring in a pinball table for us to play with that they'd made from reclaimed materials. But not before the children had designed their own pinball table to a specific design brief. Where every child from 6-11 got the chance to write a program in Scratch on a Raspberry Pi computer to make a Lego crocodile bite their finger when they put it in its mouth. This project was picked up by Wired magazine, featured in a BBC documentary on coding as well as global Al Jazeerah news bulletins and Brazilian newspapers. It created so much interest in the school that there now a weekly Code Clubs. A blissfully simple storytelling activity. Collaborate with a small group to write a short story, create some characters and bring it to life on the wall using an old overhead projector. Bringing out the interior designer in every child. Design and decorate the room of your dreams, in a shoebox. Damien Hirst eat your heart out. We rescued an old spin painting machine from Cromer pier and demonstrate centrifugal force with paint. The children's faces say it all. This activity does what it says on the paint tin. Simply let rip and splatter paint against boards. And call it art. Never say never... you can do it. In this activity, every child was taught to play a short tune on a ukulele. Our favourite inventor, Darcy Turner, brought his wire bending and metal bashing machine in and created a 3m high sculpture that adorns the playground today. Anthony Gormley would be proud of us. Never mind animation apps, here the children drew sequences on strips of paper which they put in the Zoetrope and spun to bring them come to life. We love animation apps too - but sometimes less really is more.